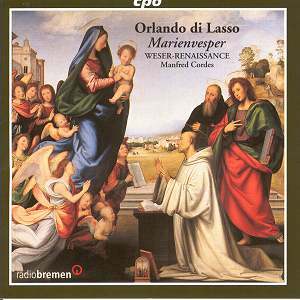 This excellent CD consists of a series of compositions representative of the variety of sacred pieces that Lassus wrote for the celebration of Vespers at the court of the Wittelsbach dukes at Munich in the second half of the sixteenth century. It was in 1556 that Lassus, born in Mons in what is now Belgium, was first engaged at the court in Munich. Not until 1563, though, did he also assume full responsibilities for sacred music at Munich, when he was able to build on a rich and solid tradition that had been established in recent generations by his predecessors. Particularly loved by the dukes were the psalm motets composed by Lassus for Vespers as sung regularly at court. Munich was a court, it is to be noted, where veneration of the Virgin Mary played an important part in that city’s role in the Counter-Reformation. And it’s sure that the motets presented on this CD were amongst those heard on the many feast days devoted to the Virgin in the sixteenth century. Celebrations actually began with Vespers on the day before the official feast… on the evening of 14 August for the Assumption on 15 August, for example. Then, second Vespers were celebrated in the next early afternoon in order for Compline to complete the day’s liturgical events before the evening meal. There were many variations on what could constitute Vespers in Lassus’ time. The importance of the occasion dictated what was included and what was not; and the forces at Lassus’ disposal; and which members of the ducal family and entourage were in attendance. Psalms with simple monophonic chants were simplest though Lassus also wrote polyphonic (up to eight-part) settings with attendant antiphons, responsories and hymns. He is known to have incorporated material by Ludwig Senfl, who had been at Munich since 1523, in some of the works he composed for various of these Vespers services. Performance of the dozen items here is necessarily in some senses speculative: we know both that the organ played colla parte and that the vocal ensemble probably consisted of between fifteen and twenty adult males and a dozen or so boys’ voices. Soloists would have taken passages that were intended to have special emphasis. Contemporary accounts also describe some instrumental accompaniment (by cornets and trombones, for instance) where this was consistent with the building and its acoustics. As the informative notes (which also include original Latin texts with German and English translations) in the CD liner point out, there will have been many occasions when restrictions dictated by court etiquette meant that there would have been as many players as listeners! Weser-Renaissance (an ensemble of singers and instrumentalists some thirteen strong) is ably led by Manfred Cordes. Perhaps the single most striking qualities of their performance here are dignity and gravitas. Which is not to say that their approach is over serious: you only have to hear the zest and lift which they elicit from the Dixit Dominus or Lauda Ierusalem, for example, to understand how closely they are in touch with Lassus’ idiom and musical and liturgical intentions. The next attribute of their performance style that impresses is a meticulous attention to pure and purposeful articulation: the embrace of words and melody, texture and structure in the Laudate Pueri, for instance, truly does make the listener - or participant – pause to appreciate the object of the praise, rather than merely walk though a perfunctory orison. There is real compassion and empathy, for instance, at ‘et de stercore erigens pauperem’… the pauper lifted from the mud. Nor is this identification with the soul of the music the result of a spurious ponderousness in pace (though most of these pieces are indeed taken slowly) or lack of effusiveness. You feel as though you are being allowed to respond to Lassus’ intentions directly as much as anything because the integrity of what he wrote here is so closely respected by Weser-Renaissance. The composer’s individual imagination is rendered as prominent by these sensitive interpreters as is his use and adaptation of contemporary conventions. The deliberate and calm (not to say almost calming) unfolding of Laetatus Sum, could so easily become a dance-like or superficial exposition of emotions (fulfilment, gratitude) which we may know in one form or another. Instead, the soloists and ensemble here approach the rather scant weave as if this were the first time either performer or listener had encountered those emotions. The stated aim of Manfred Cordes, one of whose specialities is the relationships between key and affect in Renaissance music, is to present the best blend possible between ‘flawless musicology’ and ‘animated presentation’. That they do not make this aim sound at all contradictory on this disc is indicative of their – and the CD’s – success. It’s thoroughly recommended, then, both as an introduction to this corner of sixteenth century polyphony and as an example of how to capture the musico-liturgical intentions of one of its greatest exponents when working in this devotional framework.